The Championship Manager series is a series of British soccer-management simulation computer games, the first of which was released in 1992. The Championship Manager brand and game was conceived by two brothers: Paul and Oliver Collyer. 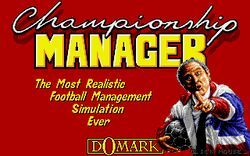 In a scenario typical of many self-made computer game programming teams in the early days of the industry, the original Championship Manager game was written from their bedroom in Shropshire, England. Since then, they have founded a development company to take the game further, Sports Interactive, and are now based in Islington, North London. Oliver now only works for the company on a part-time basis, but remains co-Chair, with his brother. The Collyer brothers and Sports Interactive are no longer involved with the development of Championship Manager. Pages in category "Championship Manager"
This page was last edited on 12 October 2016, at 16:46.